Spend the 25th (Tue) immersed in therapeutic waters at a local thermal spa. There's still lots to do: admire the landmark architecture of Parliament, pause for some photo ops at Shoes on the Danube Bank, take in the spiritual surroundings of St. Stephen's Basilica (Szent Istvan Bazilika), and contemplate the long history of Matthias Church. To find photos, maps, ratings, and tourist information, read Budapest trip itinerary planning app . Ciudad Obregon, Mexico to Budapest is an approximately 29-hour flight. The time zone changes from Mountain Standard Time to Central European Time, which is usually an 8 hour difference. Expect colder temperatures when traveling from Ciudad Obregon in December; daily highs in Budapest reach 5°C and lows reach -1°C. Finish your sightseeing early on the 26th (Wed) to allow enough time to travel to Mexico City. 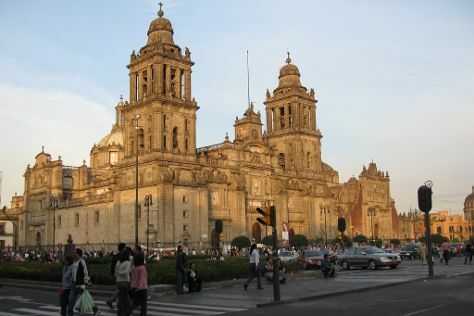 Mexico City is known for museums, historic sites, nightlife, shopping, and nature. Your plan includes some of its best attractions: examine the collection at National Museum of Anthropology (Museo Nacional de Antropologia), contemplate the long history of Metropolitan Cathedral (Catedral Metropolitana), take in the architecture and atmosphere at Basilica de Santa Maria de Guadalupe, and browse the exhibits of National Palace (Palacio Nacional). To see reviews, where to stay, photos, and other tourist information, read our Mexico City visit planner . You can fly from Budapest to Mexico City in 19 hours. Another option is to do a combination of flight and bus. The time zone difference when traveling from Budapest to Mexico City is minus 7 hours. Traveling from Budapest in December, expect nights in Mexico City to be somewhat warmer, around 9°C, while days are warmer, around 26°C. Cap off your sightseeing on the 29th (Sat) early enough to travel back home.